In medium bowl, mix flour, baking soda, salt and baking powder; set aside. In small bowl, mix hot water and cocoa until dissolved; set aside. In large bowl, beat shortening with electric mixer on medium speed 30 seconds. Gradually add granulated sugar, about 1/4 cup at a time, beating well after each addition. Beat 2 minutes longer. Add eggs, one at a time, beating well after each addition. Beat in 1 teaspoon vanilla. On low speed, alternately add flour mixture, about a third at a time, and cocoa mixture, about half at a time, beating just until blended. Divide batter evenly among muffin cups, filling each about two-thirds full. Bake 20 to 25 minutes or until toothpick inserted in center comes out clean. Cool 5 minutes; remove cupcakes from pans to cooling racks. Cool completely, about 30 minutes. In large bowl, mix powdered sugar and butter with spoon or electric mixer on low speed. Stir in 1 tablespoon vanilla and 3 tablespoons milk. Gradually beat in just enough remaining milk to make frosting smooth and spreadable. Frost cooled cupcakes. Cut straws into 3 1/2-inch lengths. Cut colored paper into flags. Tape each flag to one end of each straw piece; poke into cupcake. 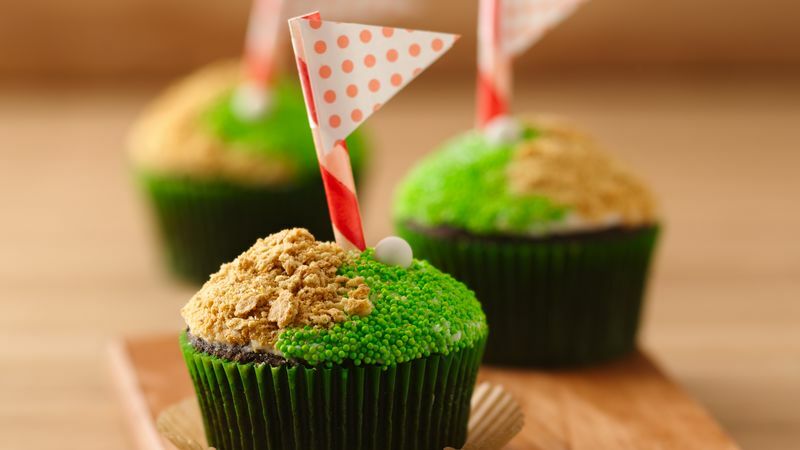 Gently press one gum ball into each cupcake for golf ball. If Dad's not a chocolate fan, make white or yellow cupcakes instead. For a white cupcake recipe, see Dreamy Sleepover Cupcakes. For yellow cupcakes, see Fireworks Cupcake Towers. For a Dad's Day party, arrange green Easter grass or green tinted coconut on a serving platter; add cupcakes. Use 1 box Betty Crocker™ Super Moist™ devil's food, white or yellow cake mix instead of from-scratch cupcakes. Make cake mix as directed on box, using water, oil and eggs or egg whites. Bake and cool as directed on box. For the frosting, substitute 1 container (1 lb) Betty Crocker® Rich & Creamy vanilla frosting. Decorate cupcakes as directed in recipe.